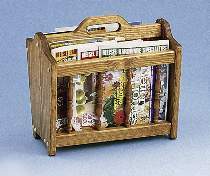 This magazine rack will keep all your magazines nice and neat and right at hand. Easy to build from 3/4" and 1/4" stock. All patterns drawn FULL SIZE. Measures 15-1/2"L x 13-1/2"H.